At Dell Children’s, we want the kids in our care and their families to feel as comfortable as possible while they’re with us. That’s why we offer a number of amenities, whether you’re here as a patient, supporting as a family member or visiting as a friend. ATMs are available on the 1st floor inside the cafeteria seating area, and on the 3rd floor next to the main information desk. Chapel & Reflection Garden: Located on the 3rd floor next to the butterfly wall, the Chapel is open 24 hours a day when services are not in session. A schedule of services is posted at the entrance. Dining services include the Thyme Out cafeteria on the 1st floor and the Holy Roast Coffee Shop on the 3rd floor near the information desk. Vending machines are located by the main elevators on each floor. We also offer ‘At Your Request’ room service dining featuring a kid-friendly full menu, and you’re welcome to order food from one of the many surrounding restaurants for pickup or delivery. Families who have children with special dietary needs can speak with one of our dietitians. Family Lounges are located directly outside each patient unit on 2nd, 3rd & 4th floors. They’re available 24 hours a day, and each has a coffee maker (coffee is provided), fridge, microwave, telephone and TV for families to use. There’s also a Ronald McDonald Family Room located adjacent to NICU on the 4th floor, which features a laundry room as well as two computers with Internet access. The Family Resource Center is located near the main entrance on the 3rd floor. The Center offers resources ranging from computers to books and DVDs, and a medical librarian is available during daytime hours if you’d like help researching your child’s illness. Free Wireless Internet Access: To help children, their families and visitors stay connected with life beyond the hospital, free wireless Internet access is available. Patient rooms also have ethernet ports for those people who don’t have wireless computers. The Family Resource Center has several PCs with internet access for families without computers. Our Gift Shop is located on the 3rd floor by the information desk. Interpreters/Language Services: If you and/or your child do not speak English or if you are more comfortable communicating in another language (including American Sign Language), qualified interpreters are available to assist you 24 hours a day either in person or by phone. You can also request a TDD/TTY communication device. Outdoor spaces available for families include a Healing Garden, accessible on the 2nd floor through the south entrance near PICU, along with a number of beautifully designed walkways and courtyards. The central courtyard is accessible from the 2nd floor, while patios overlooking the central courtyard are accessible from the 3rd and 4th floors. Playrooms for kids and siblings 10 and under are located on the 2nd, 3rd and 4th floors. The 4th floor playroom is for hematology/oncology patients only. 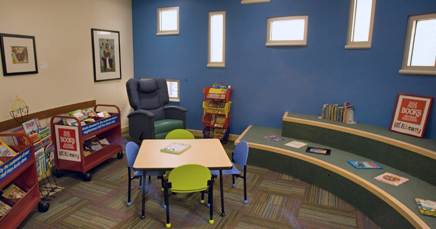 The Teen Room is for kids and siblings 10 and older, and can be found on the 4th floor. Family Sleeping Accommodations are part of every child’s room. There’s a sofa bed that sleeps two adults, and all rooms are equipped with a tub and shower. We provide bedding and toiletries, or you can bring your own from home. Our housekeeping team (environmental services) takes care of cleaning the room and emptying the garbage. Ronald McDonald House (RMH) serves as a home base for families while their child is hospitalized. The RMH includes sleeping rooms along with meals, a full kitchen and laundry facilities. A member of the healthcare team must refer families to the RMH. For more information, call 512-472-9844 or visit rmhc-austin.org. A RMH Family Room with laundry, kitchen and lounge area is located inside Dell Children’s near NICU on the 4th floor.